ARP Pattern 44 Felt Hat with ribbon and ARP badge affixed. 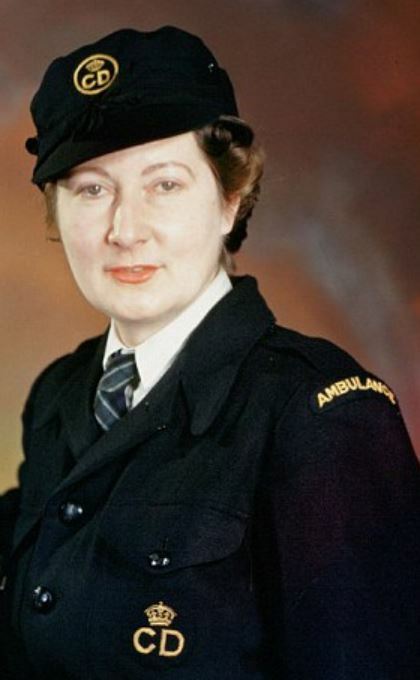 At the start of the war, female ARP Wardens were initially issued with ARP Pattern 44 Felt Hats. 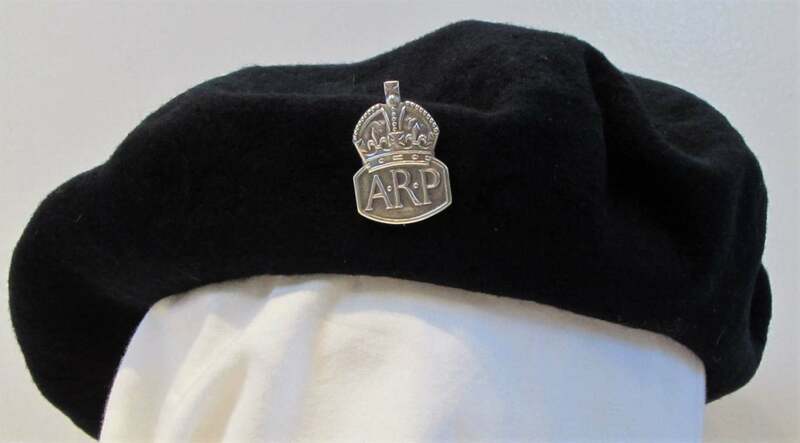 It was permitted to wear the silver ARP lapel badge on these hats. 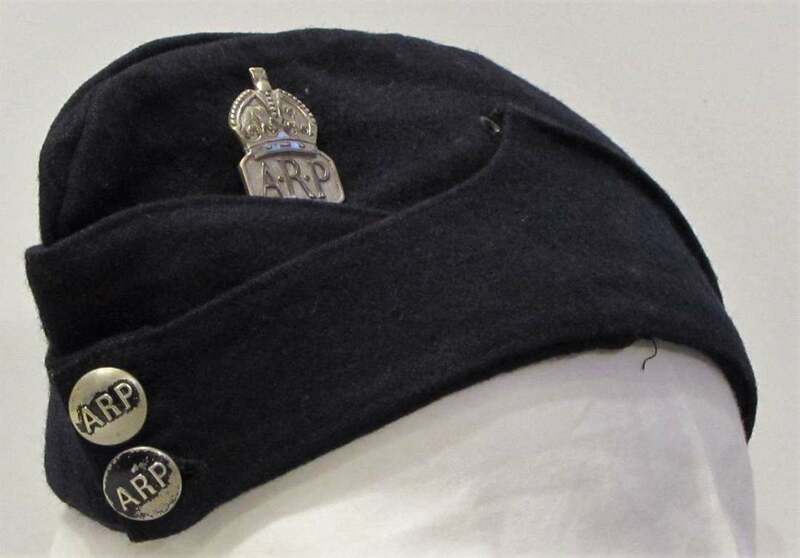 Early in the war the hats featured a red and blue ribbon; this was later replaced by a gold and blue ribbon (ARP Pattern 143) when the Civil Defence name change came into force in 1941. In the latter years of the war, many adopted the wool beret but there is also photographic evidence of some wearing the side cap (some with and some without piping). See below. 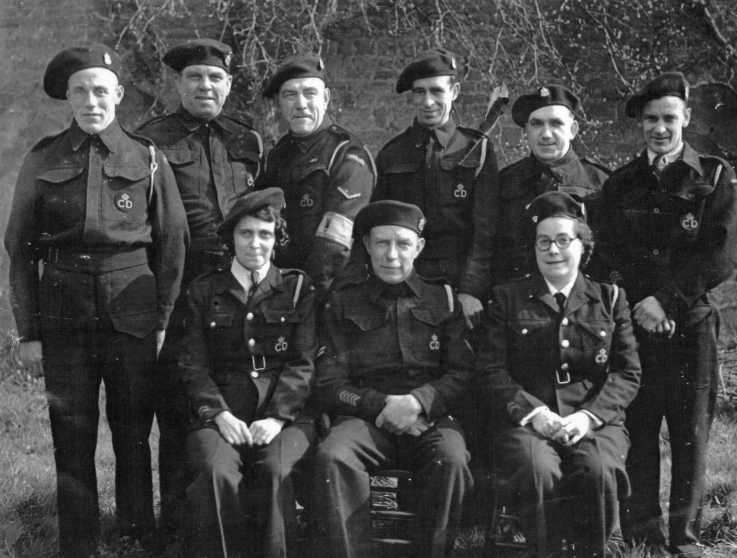 ARP wardens wearing the wool beret - note the many different ways of wearing the beret. For men, it was given that they should wear their helmets but this was impractical. From July 1941 a blue beret of unlined wool with no leather sweat band was authorised. 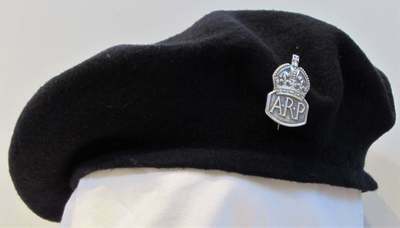 Though no badge was available for the berets a number of local authorities permitted the wearing of the silver ARP lapel badge on the berets. This became officially recognised in April 1942. Some authorities requested to wear their county emblem. 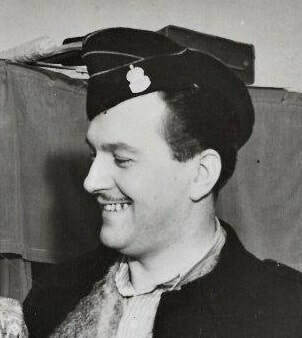 With the production of metal ARP lapel badges in May 1943, new recruits needed a cap badge. 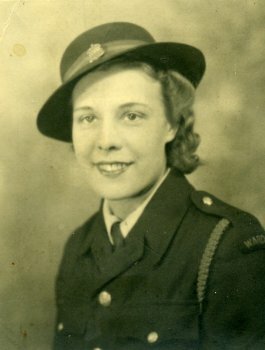 In May 1943 a badge was designed for wear on berets. It was a smaller version of the breast badge - printed it was 1.6 inches across. ​An interesting aside to the wearing of berets is the many styles of wear. 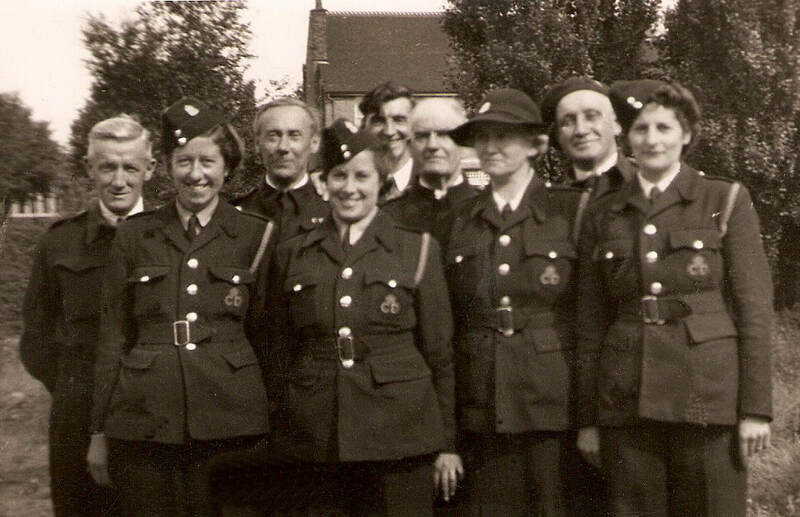 Period photographs show the berets worn over the right and left ear, worn straight, pushed right back etc. It' possible to get all these various on the same group photo. 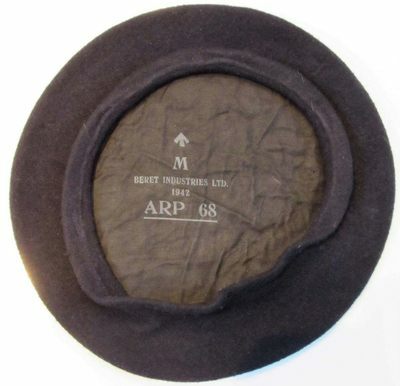 WW2 ARP Pattern 68 beret with outer liner band - side view. 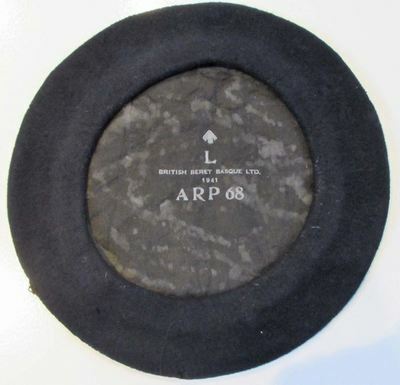 WW2 ARP Pattern 68 beret with outer liner band - inside view. WW2 ARP Pattern 68 beret with inner liner band - side view. WW2 ARP Pattern 68 beret with inner liner band - inside view. Civil Defence personnel wearing the side cap with lapel badge. There is ample photographic evidence of both rank and file as well as senior officers in the Civil Defence services wearing side caps. These side caps were identical in design and manufacture as those issued to army personnel. Lewisham Rescue Squads appear to be wearing all black wool side caps with two chromed buttons. Side caps do not appear in the official Civil Defence pattern list but were available from commercial manufacturers for private purchase. Some included a yellow piping (probably for senior ranks within the various CD services). 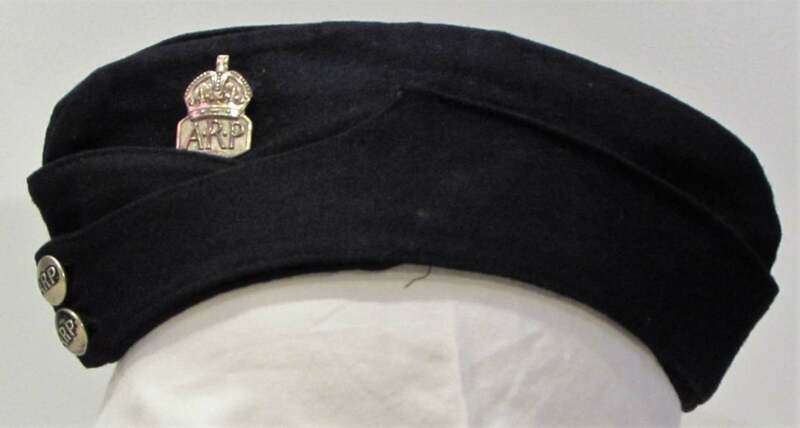 The majority of photos show the ARP lapel badge (usually the brooch fitting style) attached to the side cap. Some appear to have ARP buttons to the front, others have unmarked plain chrome buttons. WW2 ARP Civil Defence Dark Wool Side Cap (front). WW2 ARP Civil Defence Dark Wool Side Cap (side). 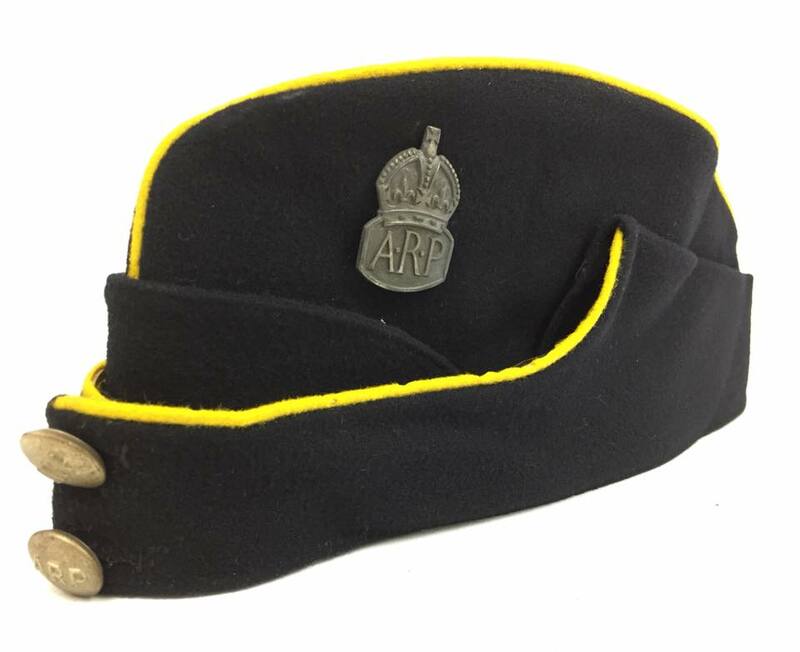 WW2 ARP Civil Defence Dark Wool Side Cap with Yellow Piping (probably for an officer). There are a few photographs showing the side cap without buttons to the front. This photo of a piped (probably yellow) side cap also shows the ARP in a lower position on the side cap. Civil Defence Ski Cap for women drivers. Period photographs show female drivers wearing ​a distinctive peaked cap (ARP Pattern 45).